After meeting the guys over at JTune, I had the chance to shoot some of their cars. I’ve never been in a GTR before, so having a ride in this thing was amazing. The sheer power of the RB26DETT was enough to make a grown man weep. 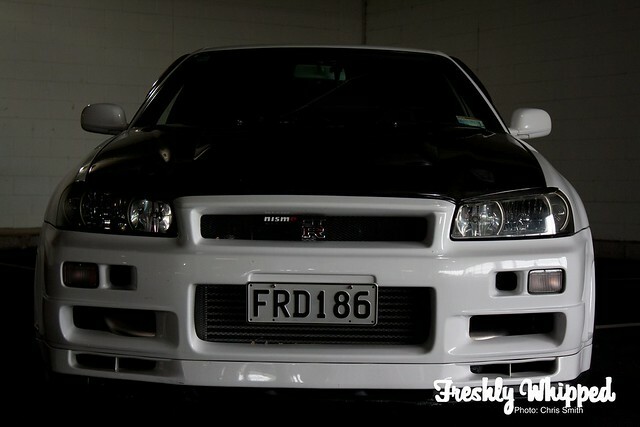 The car itself is an R34 GTR in White. The carbon fibre hood helps add to the somewhat ‘stormtrooper’ look. The wheels, which owner Matthew tells me we are going to call ‘King Kongs’ also help to accent the Stormtrooper feel. How can you not like an RB26DETT? What’s not to love? I love the interior on the R34 GTR’s. The awesome screen mounted in the centre of the dash helps to give off even more of the racing look. There’s something about the staunch front of these cars that make them look so meaty. They look like they mean business and as we all know with an RB26 under the hood, they do. These wheels are as big as they look. Lovely wrapped around some Goodyear tyres. I wanted this shoot to have a somewhat ‘Tokyo drift/Fast and Furious’ feel to it, hence the underground car park. The spotlight above helps bring out the brightness in the white paint. So remember that part where I said the car looked meaty? I’m definitely sticking to that initial response. Thanks a lot to Matthew for letting us share his car with you all. The sheer power of the twin turbo’s still rings in my ears today. No doubt we’ll have more from the guys over at JTune in the future.